BA Painting recent graduate, Annie-Marie Akussah, has had her work selected to be featured in this year’s New Contemporaries exhibition. 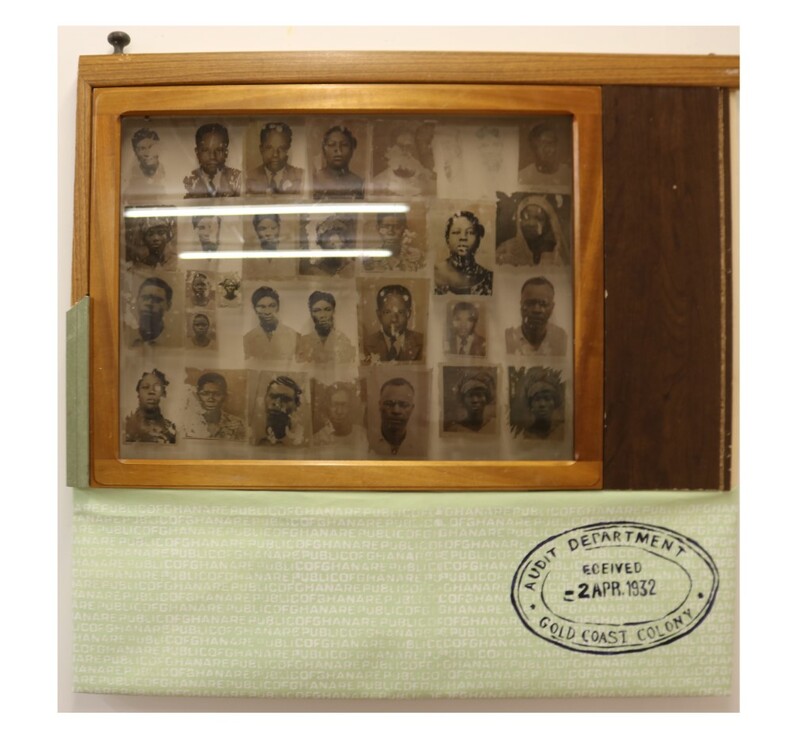 New Contemporaries provides a platform for new and recent fine art graduates to showcase their work. Earlier this year the exhibition was shown at the Liverpool School of Art and Design, and it will travel to South London Gallery in December. We sat down with Annie-Marie to discuss her selection for New Contemporaries, her artistic practice, focusing on the themes of migration and identity, and how she juggles studio time with her role as Activities Officer with the UAL Student Union. How does it feel to have your work featured in New Contemporaries? It feels really incredible to be exhibiting my work anywhere, let alone at an exhibition like New Contemporaries. 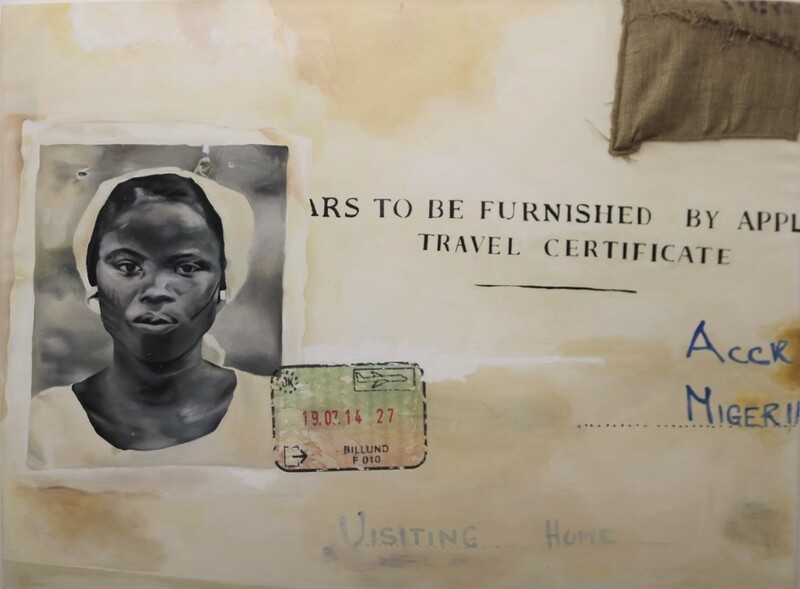 I didn’t really know much about New Contemporaries until another Wimbledon student a couple of years above me was shortlisted for it, Violet Hwami. That’s when I first heard the name, but I didn’t really know what it was or what it meant to be a New Contemporaries artist. When I was in third year, the tutors advertised the opportunity to all of the BA Painting students and encouraged us to apply. They spoke really highly of New Contemporaries as a platform to showcase your work, so it feels great to be a part of something that they all hold in high regard. We had to apply by submitting five images of our work online. Pretty much everyone in third year was submitting on the day of the deadline, so the website was really slow! We were actually all in the Library together applying for it at the same time. The submission process excluded your name, college and gender, so you know that it really was about the quality of work and not any other factors. A few months after that I found out that I was shortlisted, and New Contemporaries wanted to see all five of my submitted works in person. They ended up choosing two of them to be featured in the exhibition, both of which I made in the second year of my course. Can you talk about the two pieces you are showing at New Contemporaries? The two pieces are being split across both exhibitions, so one of them was at the Liverpool Biennale which has just finished and the other will be shown at the South London Gallery exhibition which opens on 5 December. The piece I showed in Liverpool was called ‘Spaces’ and it was a large square painting that had screen-printed text on it as well as a stamp. 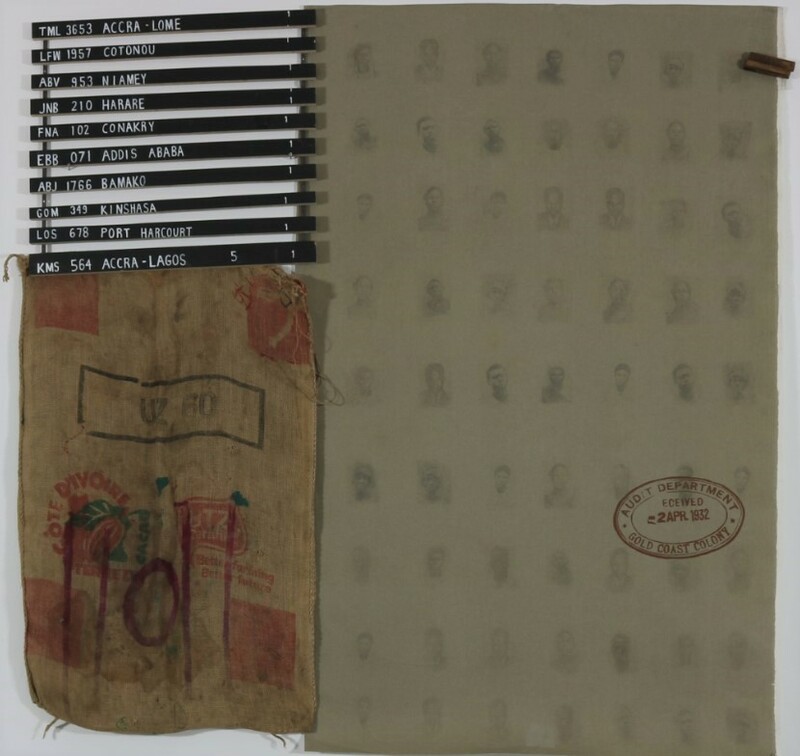 The text is taken from a Ghanaian passport that was made in the fifties. The work is about the spaces that people who are traveling or are expatriates exist in, ranging from immigration offices to council estates. Most of the shapes and the colours in the piece are inspired by council flats, mostly council estates that I see regularly or ones that I’ve lived in myself. 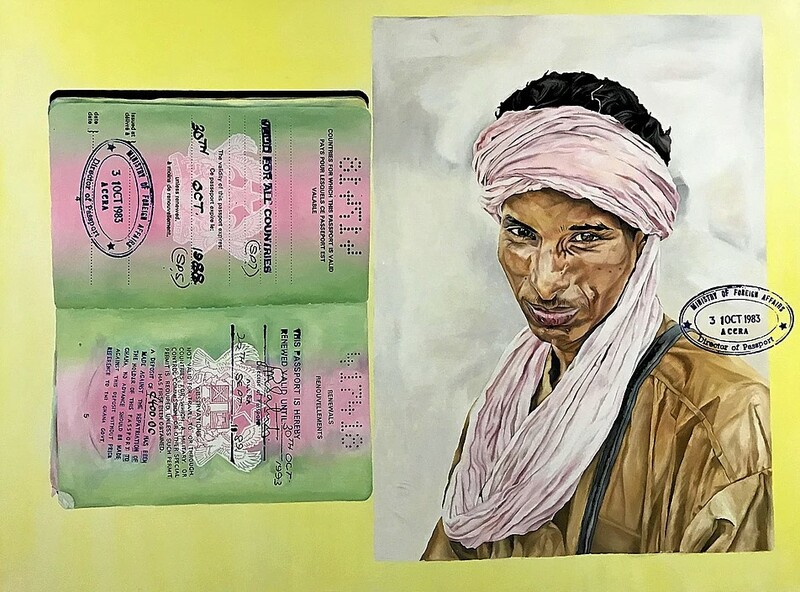 The work that will be showing at the South London Gallery is also about migration, and focuses on the idea of passports and whether they are a means of identification or ‘ownership’ from a certain country. It’s called ‘A Portrait of Two Men’, but it’s really only a portrait of one man and his passport. I went to the Liverpool Biennale to see my work there. All the artists had opportunity to go and New Contemporaries funded our travel. It was really great to meet all the other artists and see their work, and it was really empowering to discover what young artists are talking about today. 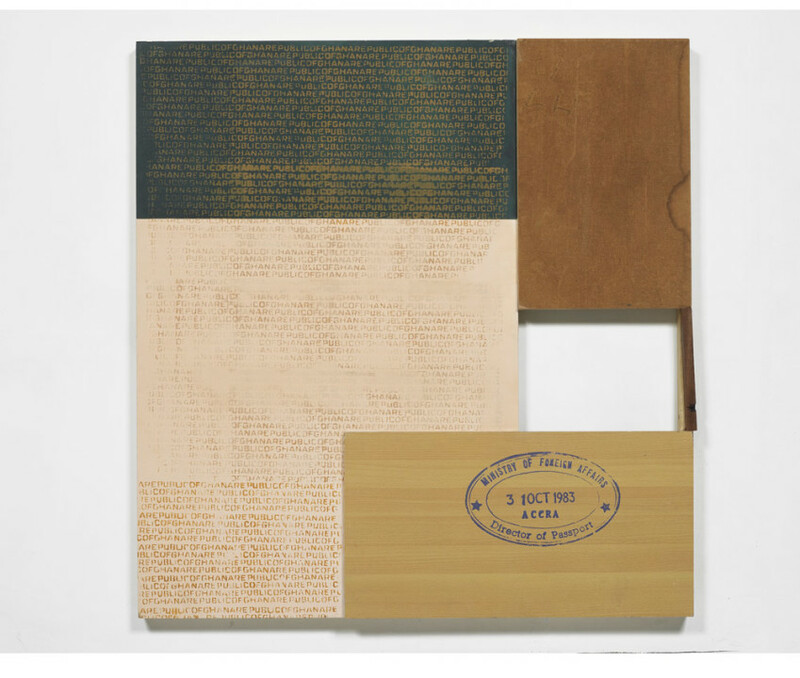 The majority of the work seemed to focus on contemporary political issues. Young artists are not afraid to talk about politics these days. I’m very excited for when the exhibition opens at the South London Gallery because London is where I live, so more of my family, friends and past tutors can attend. Who else’s work in New Contemporaries do you love? Everyone’s work is incredible, but I’m really enjoying film these days, so I would say one of the things that moved me was Ayo Akingbade’s film ‘Tower XYZ’, and also an installation by Kobby Adi. I really enjoy all of the work in the show, but those two are my favourite pieces. Have you ever worked with film before, or would you like to in the future? I think film is becoming very popular in an urban context, for example the way music videos are being shot these days they are almost like short films. I’ve only ever made one film, which was in my third year. I received a lot of help from the Film and Video Technician here, Jack Perry. I had a few clips but I knew nothing about editing or the language of film. I made a short example film so that Jack would know the direction I wanted to head in, and then he helped me through the process. The film was about the crossing of the Mediterranean Sea, because I was thinking about the first crossing for Africans from Libya. I had a few clips of myself falling off a boat, unintentionally, in Malta. I had a GoPro in my hand. I didn’t know how to swim but decided to go on a banana boat, and the boat tipped and I fell in the water. It wasn’t fun at the time, because I was terrified and screaming, but I ended up with some really cool footage. Then when I went traveling, to Venice and Tanzania, I was filming a lot of bodies of water. I compiled all of that footage and decided to make a film out of it. I don’t think I’d ever limit myself to the medium of paint, because I think each medium has a different language. Whichever language is suitable for the context of the work, that’s what I’m willing to learn and use. For that piece, film was the only medium I could’ve used to have that conversation. I tried to express it through painting at first, but it didn’t work. Can you talk about what else you’ve been up to since graduating? I’m lucky to be a part of a studio space that I share with five other Wimbledon graduates in South Bermondsey. It’s a huge space, similar to what we had here at Wimbledon. I work full time at the Student Union as well, so I have to make a conscious effort to make time for my practice. I make sure I’m there after work, and if I’m too exhausted I make sure I spend my weekends there. Ultimately, art is what I want to do, so ensuring I make the effort is really important. I’m looking into both further study and residencies at the moment. While I was a student here I was awarded the MEAD Fellowship, so in April of next year I’ll be running workshops in Ghana. One thing I’ve learned from applying for lots of different opportunities over the years is that public programmes are a really big part of my practice. I really like engaging people in learning. When I make my own paintings, I am always learning new things by visiting the archives or the Library to read about different subjects, then making work based off what I’ve learned. When I finished third year, I knew I didn’t want to do an MA straight away. I was excited about what I had discovered about myself as an artist throughout my degree, so I wanted to give myself time to make work in my studio. I’m really interested in doing a residency somewhere, and then possibly an MA later on. But for now, I am really enjoying public programmes and having the chance to reach people who don’t normally engage with art. Can you talk about your role with the Student Union? I’m the Activities Officer for this academic year, and I was elected during my third year. The role works closely with the students to help them set up sports clubs and societies, and also helps them to find creative opportunities. I also organise exhibitions of student work, and one of my priorities is to find residency opportunities for students outside term time, so students can add to their professional development outside of their studies. The Activities Officer role actually fits in really nicely with my artistic practice. I’m enjoying the job a lot. Where would be your dream place to exhibit your work and why? I can’t name a specific gallery I’d really like to show at, although I’d really like to exhibit my work anywhere in Ghana because that’s where I’m from. I’d like to exhibit in a gallery that believes in the work I’m making, and not just for the purpose of me selling work. I’m actually really bad at the commercial side of being an artist, and I find it hard letting go of my work. My work is very personal and I do want people to be able to engage with it, but to me it’s like a good book; I will lend it to other people but I always want it back! Do you have any other exhibitions coming up? My work is being exhibited at the Ashurst Group Show opening on 6 October, and I’m also exhibiting in the FBA Futures exhibition at Mall Galleries from 8 – 19 January 2019. You can find out more about Annie-Marie and her work by visiting her website and following her on Instagram. The New Contemporaries exhibition is taking place at South London Gallery from 5 December 2018 until 24 February 2019. You can find out more on their website.